It has been a stressful month for us (well Court is still studying) and my skin usually would have been at its worst during this time if it wasn't for the bee venom on my face. Yes you read that right. 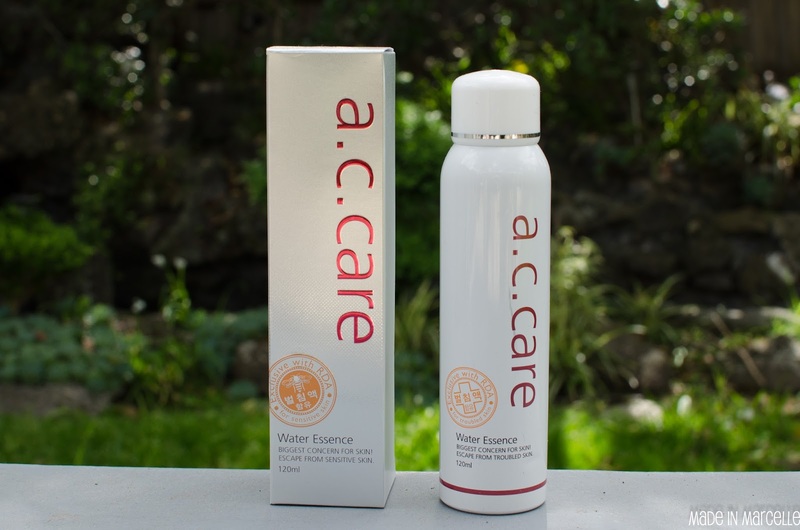 The A.C Care Ultimate Cure has been keeping my skin relatively clear during this exam period. You'd think that after many years of studying for uni that I would be organised and ready for those papers, of course not. 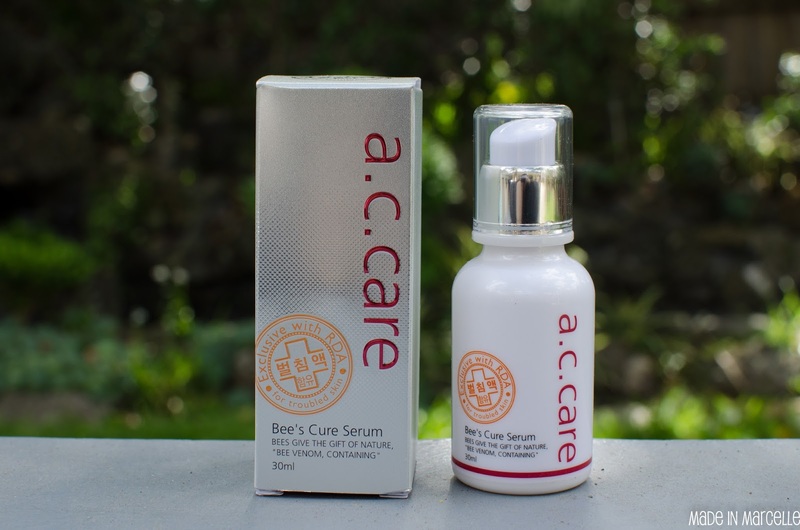 The key active ingredient within the A.C. Care Cure Serum is venom from the Apis mellifera family of Honeybees, which primarily act to remove keratin and sebum, eliminate acne inducing bacteria and block inflammatory agents within skin pores to heal acne lesions. This is complemented with several other supporting ingredients including Royal Jelly Extract for skin- cell regeneration, Calendula Flower Extract to remove skin redness, Tea Tree Extract to prevent future acne and Silk Protein to restore the natural skin texture. By using all of the above A.C. Care treatments simultaneously, their acne elimination and skin healing effects are synergistically amplified – resulting in a much faster, more efficient and extremely effective acne cure. 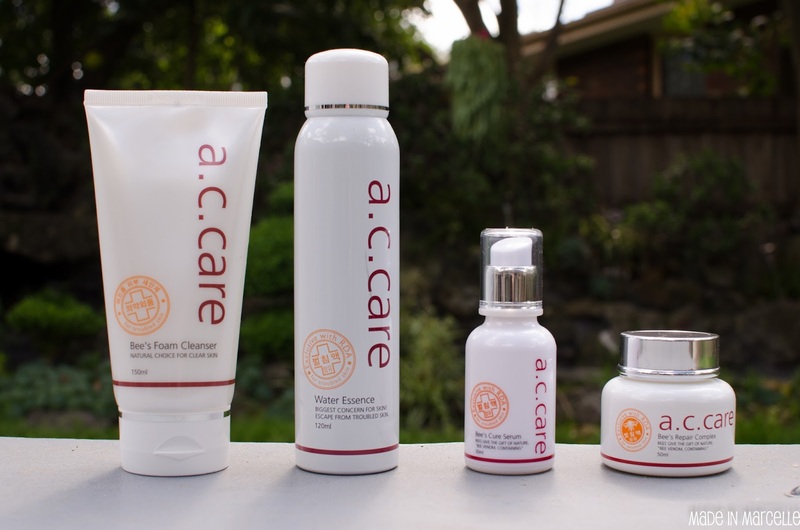 The idea behind these products is to cure acne using "organic components from nature". When you first open the products they have a subtle floral scent and something that I can't quite put my finger on. All I know is that it reminded me of sunshine and happiness. One week later. I'm impressed. 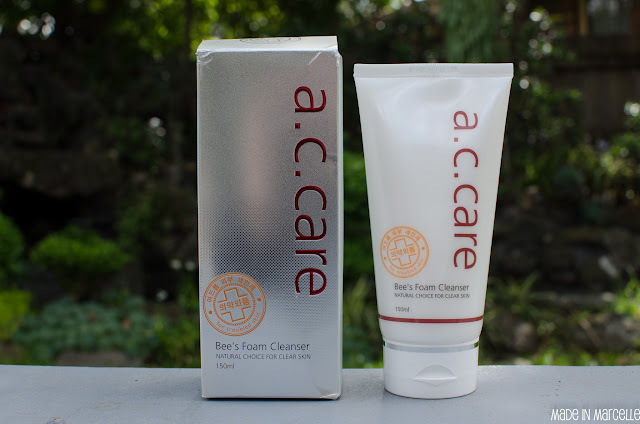 Right before I started using this regime, my skin was very congested. I had a lot of bumps underneath the skin which I knew was going to be a full blown acne breakout in a week or so. If you look closely at the photo above, you can see these red patches. In real life they're bumpy and painful to the touch. This happens a lot with me when I start staying up late stressing for exams. A lot of the time they become quite large and red, even pustular. But after using this regime for a week my skin did not end up all spotty. Yes some of those bumps did end up coming to the surface but that meant they healed a lot quicker compared to sitting painfully underneath the skin. Even though they surfaced, the pimples were not that inflammed and the small bump went away quietly after a few days. 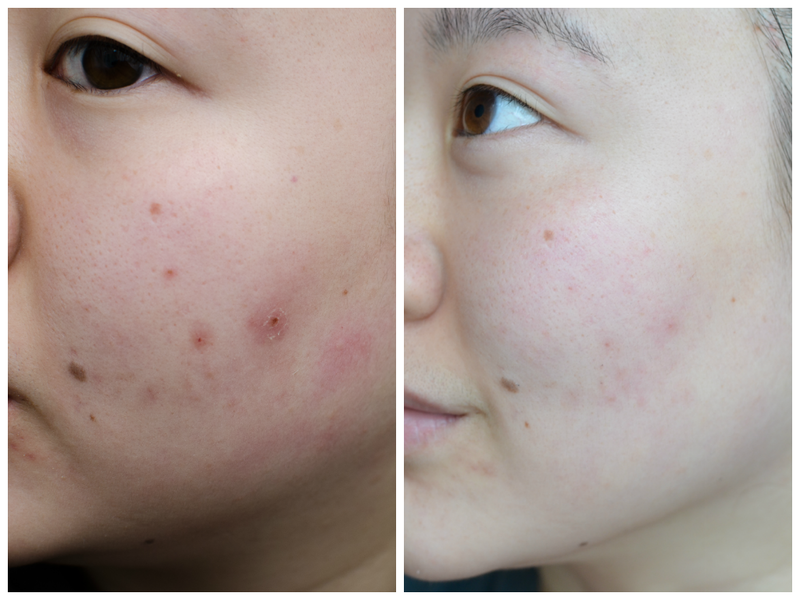 I was so surprised how "clear" my skin looked just from this reduction in redness. My skin was smooth but probably not for the right reasons. So my face is dry/normal and I found that just these products alone made my skin quite taunt. It wasn't my usual flaky dryness either, more just dehydrated. This was probably because I wasn't using a moisturiser with it because the Repair Complex seemed sufficient at the time. So after a week I decided that my skin needed a break. Bad idea I tell you. After a couple of days angry red spots started showing up, Court was wondering if it was due to the products? No, just my own stupidity. Quickly I started the regime again (with a night time moisturiser) and my skin has definitely thanked me since then. In terms of fading old scars, I did not find that it made a huge difference. Only reducing the production of new ones. My skin definitely feels clean and firm after using it. Not drying as I would have expected of a cleanser but you can still feel the slight soapiness of it. 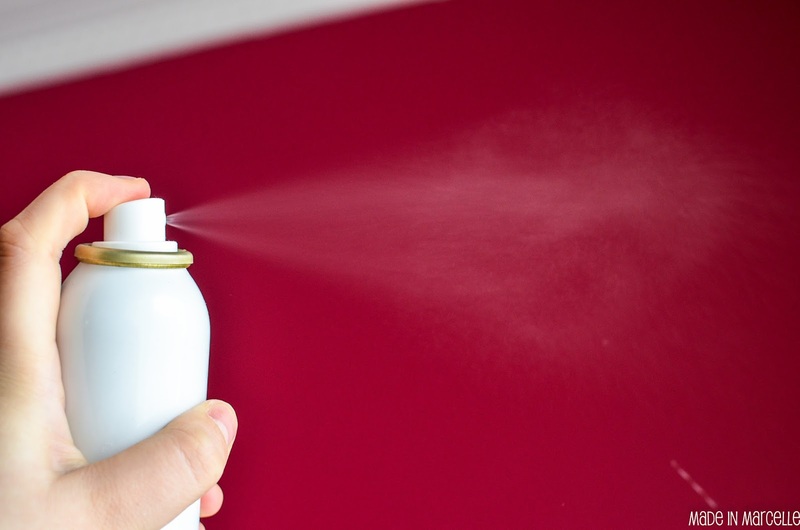 As you work the product in, it does foam up and helps with lathering. You can see at the photo at the bottom just how creamy this product is when applied. The packaging of this was so surprising because I don't normally associate an "essence" with a spray form. This is mostly a water based product (with the bee venom of course) that you spray right after cleansing. I'm thinking it's meant to be like a toner. 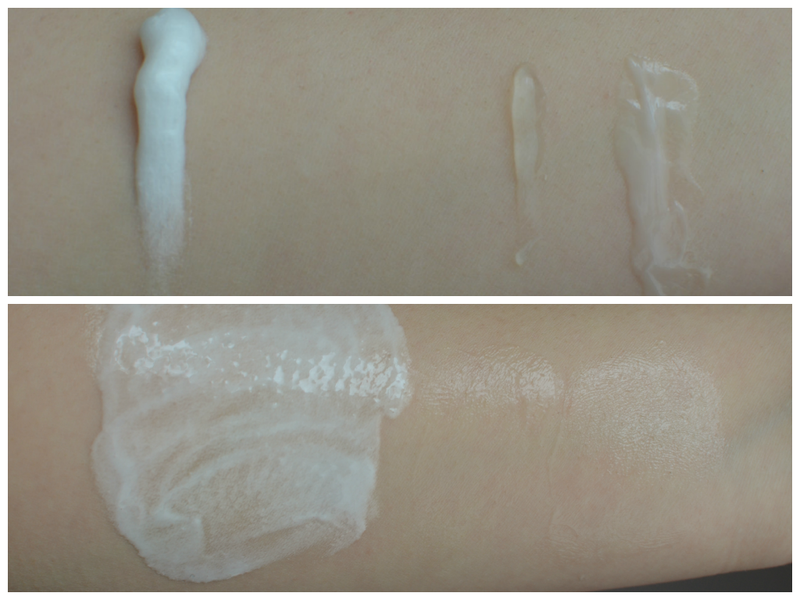 The mist that comes out is very soft and almost non-existent on the skin after application. This was a nice change to my other mists which leave my face dripping but this is probably my least necessary product. Look how fine that mist is. This is the concentrated product which is helping to reduce all that redness and inflammation and is the main focus for the whole range. I was a little worried at first because the scent of this made it seem like it was an alcohol based product but luckily it's not. This absorbs into the skin very quickly and was a dream to use. The final step was of a gel consistency which was cooling when applied. This works as a great day time treatment and surprisingly very well under makeup. Definitely not moisturising enough alone at night, but then again my skin is very dry. Despite that I have been really enjoying this because it is so light on the skin and sets really nicely. All four products. There is the essence in that gap, but it's so fine that you can't see it. 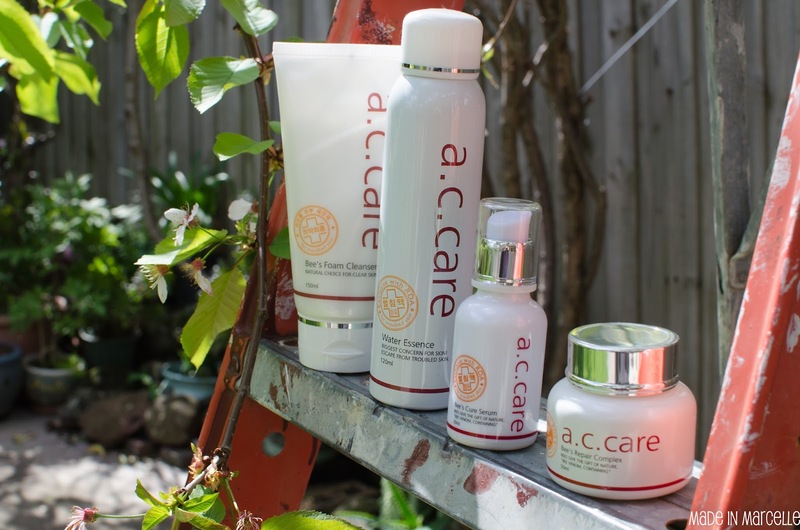 This AC Care range includes products that I can definitely see myself continuing to use. I would not say that this is the fastest treatment that I have tried but a good natural alternative to reducing flare ups. The biggest impact was the reduction in redness and inflammation which has been great. Definitely makes my skin look clearer because of this. I feel like this would work really well on oilier skin too as it is not overly thick on the skin and the products would help in overall oil control. Lúc này, thần thức Vương Lâm vẫn cẩn thận tản ra tìm tòi bốn phía. Bỗng nhiên ánh mắt hắn ngưng tại một sơn thôn cách nơi đây một vạn dặm. Lúc này bàn tay thật lớn kia sau khi đẩy lui bổn tôn lại chụp tới Vương Lâm. Từ đầu tới cuối, ánh mắt trong mây đỏ đều không có thay đổi gì. Trong nháy mắt chộp tới, Vương Lâm xoay mạnh người, hai tay bấm quyết linh lực toàn thân ngưng tụ trên một ngón tay, điểm vào lòng bàn tay kia. Thân hình Vương Lâm bị đẩy đi rất xa, trong miệng hắn phun máu tươi. Máu tươi rơi lên quyển sinh tử luân hồi chậm rãi biến mất. Tại lúc này, nguyên anh Lý Mộ Uyển vốn đã sắp bị tiêu tan lại đột nhiên trỗi dậy một chút sức sống, một chút cố chấp. do they help to remove old acne scar and acne mask? 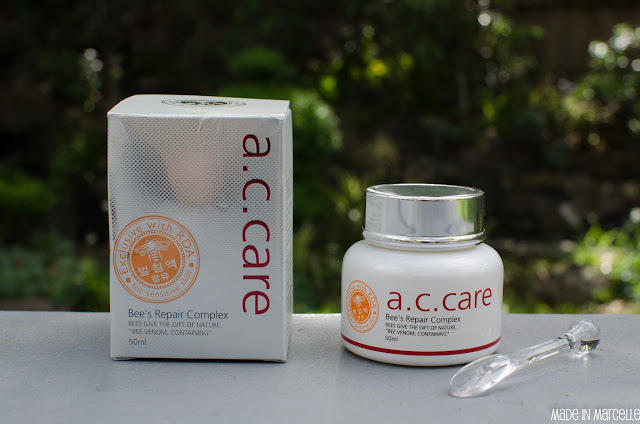 I wouldn't say it directly helped fade old scars but because I found it great for preventing new inflammation, it allowed the areas which previously broke out to heal. I was also able to massage rosehip oil to soften those marks because there was no active breakouts. My problem was that I'd break out in the same areas so I was getting scarring on top of old scarring which in the long run kept the darkness around longer. I'm hoping that made sense?